There’s a lot to consider when you’re looking for the perfect hotel to stay in for your next business trip. Being able to stay focused on your work means that each element of your trip should be as streamlined as possible. Check out our top 5 things to look for when choosing a hotel for business travelers! A great business hotel ensures that you have everything you need on site to stay connected and productive. Complimentary Wi-Fi, in-room phones, and a 24/7 business center are essential, and extra space to work makes it that much easier to stay focused. Make sure that your hotel room has a dedicated work space, and for any last-minute work needs, don’t hesitate to take advantage of the business center’s computer, printer, and fax machine. Versatile on-site meeting spaces make it easy to conduct business meetings or brainstorming sessions. Take advantage of knowledgeable event planners that can assist with catering services and A/V support. 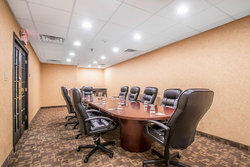 Whether you’re in need of a small board room to host an executive meeting or planning a larger corporate retreat or training session, enjoy a streamlined event planning experience when you choose a hotel that offers all of these facilities and services on site! Now that all your prep is done, don’t stress about making it to your morning meeting. Make sure that your hotel has a great location that makes it easy to get to where you need to be. 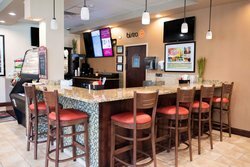 Clarion Inn Elmhurst – Oakbrook is ideally located in the Chicago suburbs, close to local corporations like Hub Group, Master Lock, Kellogg, and more, while also boasting just a quick drive to downtown and O’Hare Airport. Even though you’re in town for business, that doesn’t mean you shouldn’t explore the local area. A great hotel location also means being close to popular attractions like the Fashion Outlets of Chicago and the Brookfield Zoo so you can unwind during your downtime! On top of a great location, an ideal hotel for business travelers takes the stress away from commutes by offering shuttle service throughout the week. Travel with ease when you stay with us – we provide shuttle services to local businesses and attractions within a 5-mile radius of the hotel from Monday to Friday! During a busy business trip, it’s the little touches that make all the difference. 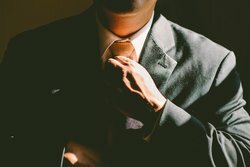 Additional facilities and services like an on-site restaurant, guest laundry facilities, and dry cleaning services means that you don’t have to stray too far from your hotel room to fuel up for the day or ensure that your clothes are clean and pressed for your meeting or presentation. Ensure that you get to your morning meeting on time by arranging wake-up service. Being on the road shouldn’t mean that you have to fall behind on your fitness routine! We’re all about keeping up with a healthy lifestyle, whether that’s through swimming some laps or making sure that you fit in that gym session. Access to an on-site pool and 24/7 fitness center means you can get that workout in, at your own pace and at your own time. Looking for a different way to break a sweat during your travels? Elmhurst also has extensive fitness facilities to switch up your routine. Courts Plus features six indoor tennis courts and a dry sauna, Patriot Boxing offers fitness classes for all levels, and you can practice your swing at Salt Creek Golf. Best of all, we offer exclusive hotel deals for all three facilities! Knowing how to choose the right hotel for business travelers can alleviate a lot of the stresses of trip planning. Here at Clarion Inn Elmhurst – Oakbrook, we look forward to making your next business trip a streamlined and pleasant experience. Book your stay in one of our comfortable hotel rooms today!